Thariy Creative? yeah, very 'creative' with excuses..
Preamble: “Caveat Emptor’ or ‘Let the Buyer Beware’ simply means it is at the buyer's risk: the commercial principle that the buyer is responsible for making sure that goods bought are of a reasonable quality, unless the seller is offering a guarantee of their quality. Have you ever had a design you wished immortalized on a T-shirt? A favourite picture of a loved one? An image of your favourite 80s glam-rock band? 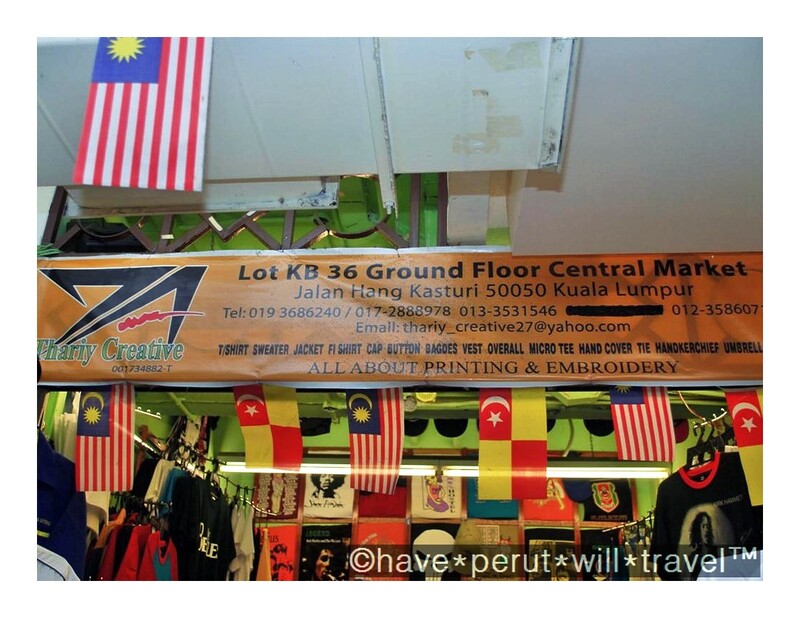 Well, in Central Market there are plenty of stalls to cater to these wishes. If you’ve ever had the urge to do so, this stall is NOT the place you’d want to place your order with! Some time back, Brendan and I were kicking some ideas around about what we wanted printed onto our custom-made T-shirts. He wanted an Avenged Sevenfold with his name in the same font as the band on his, while I’ve always wanted a Spartan (the logo from my car club) on mine. After doing some research online, we settled on the designs. Armed with the designs, we headed to Central Market on the 21st of August. There we had the misfortune of landing at the stall of this interesting (to say the least) character Azli, who runs Thariy Creative. He seemed to understand exactly what we wanted in our designs, and he seemed genuine. In his mid to late forties who boasted of his experiences in the business which spanned some 30 odd years, I was thinking to myself: What could go wrong? He explained that he would be creating a mould/template and once ready, it will be off to the Printers’. Simple as that (or so I thought!). Taken in by his smooth talking, I actually paid in full... KNNBCCB!!! Suitably cheezed off, Cat still had the patience to bite her tongue and came again on Monday the 29th of August (since Hari Raya fell on the following day, Tuesday the 30th of August). This time, the mustard (with a capital B) was missing in action and a staff member was hastily closing shop (it was only 2PM!)... KNNBCCB!!! I frantically called his cell phone throughout the day and into the night, and he refused to answer. I must have called him a hundred times but the mustard (with a capital B) didn’t have the decency to pick up. Steaming mad as I was, good sense prevailed and I refrained from harrassing him during his festive period (which lasted from the 30th of August to the 1st of September). I resumed calling the mustard (with a capital B) every day after that, from the 2nd till the 4th of September to no avail. The mustard (with a capital B) finally answered on Monday the 5th of September and professed his apologies. He got an earful, and I was particularly upset with the fact that Cat was treated like an absolute fool throughout the entire episode. He explained that his Printers was not up to scratch and failed to meet his dateline. When asked, the mustard (with a capital B) said the Printer was in Batang Kali. He then promised to have the T-shirts ready the next day. I told the mustard (with a capital B) that if the T-shirts were not ready then, I expected a full refund. He agreed. Guess what? The following day (Tuesday) he then said the T-shirts (printed in Batang Kali) failed to meet his ‘standards of excellence’ (sic) and said he’ll be getting another Printer from Rawang to get the job done... KNNBCCB!!! By this time I had given up on getting a straight answer from this mustard (with a capital B). I left it at that, and planned to get back to him on Friday the 9th of September. He actually called on Thursday the 8th of September but I was not able to answer as I was knocked out from a severe bout of diarrhoea. I called him on Friday the 9th of September as intended but the mustard (with a capital B) spun another yarn about Printers this and Printers that... nothing new. I called him again on Saturday the 10th of September but the mustard (with a capital B) didn’t answer. unless you really, really loved the merry-go-round as a child, avoid this stall like the plague! Yesterday, I went to Central Market at 1PM to surprise the mustard (with a capital B) and have a face-to-face but do you know what? The mustard (with a capital B) was nowhere to be seen, and his stall unattended. I called his cell phone only to be told that he was out for lunch, and that he’ll be back in an hour. I suspect that he was tipped off (my tattoos are a dead give-away) and made haste as soon as he (or someone he knew) saw me coming. The mustard (with a capital B) promised to call back after lunch (yeah, right!). I called him after lunch and he said that he will be collecting the T-shirts from Batang Kali later that afternoon as soon as he gets someone to help man his stall. Whatever happened to the Printers from Rawang, eh? I called the mustard (with a capital B) up again at 6:30PM yesterday only to be told that he was not able to go to Batang Kali. He said that he will collect it later last night after business hours and asked me how late I would be staying up. I told him I'll be up as late as it was going to take! KNNBCCB!!! I called the mustard (with a capital B) up again at 10:00PM to remind him of his promise. He said he in the midst of closing shop and will head up to Batang Kali pronto. I also reminded him I'll be up the whole night if need be so he had no choice but to make good on his (so far empty) promises. The mustard (with a capital B) called me back at 12:30AM today (hallelujah!) to inform that he is at the Printers at Batang Kali. Hmm... 50 kilometres in 2.5 hours? He said the T-shirts are now ‘up to scratch’ (sic) but for some minor adjustments. He will wait for the T-shirts to be done and have them stored in his car ready to be delivered to me later this Monday morning. Brilliant! 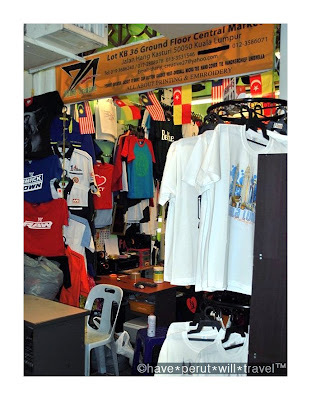 I gave him the whole day and ended up calling him at 2PM, he said the T-shirts are with him at the stall and he was willing to meet me at the Masjid Jamek LRT Station. We met at 3PM, I took possession of the T-shirts, I bade him farewell and good riddance. My T-shirts? I honestly do not know if my impression has been coloured but I had the distinct feeling I was shortchanged. The T-shirts felt light and thin to the touch and was inferior in quality (like the white Pagoda T-shirts old chinese uncles would wear). The ink was not evenly distributed across the T-shirt, too thin across some sections while too thick across other sections. Brendan’s T-shirt thankfully came out as good as it ever was going to get and actually came close to what we had in mind. The morale of the story? At the risk of offending some dear friends of mine, in Bolehland sadly most stereotypes are with merit. What a mustard (with a capital B)!! Hi there..u r lucky enough compared to me..i paid this stupid azli since april 2011.until now he still giving me excuses..like u said..he wont pick up the phone until now..
For others.pls beware of this stupid azli..
hey man, thanks for your comment and affirmation. I feel vindicated for posting this now, thought at first I was over-reacting. It seems this mustard (with a capital B) is making a habit of ripping people off!